The old colonial powers had simply drawn lines on the map when they established the colonies of Abongo, Ebongo, Ibongo, Obongo and Ubongo. As a result, the map of the five colnies was a rectangle with each colony being a right-angled triangle. Abongo, Ebongo and Ibongo each had the same area. Obongo was bigger and Ubongo was bigger still. After independence, Abongo, Ebongo and Ibongo united to form a single triangular country, larger than Ubongo. On an old map of the five colonies, the shorter side was 60 centimetres long. What was the length of the longer side? When it was originally published the information that the combined country was the largest was omitted. A correction was published along with Enigma 1043 (along with the reassurance: “All Enigmas are checked to ensure they have a unique answer”). Without this fact there are three possible solutions. I didn’t use a program to solve this one, although I did write a program to draw the diagrams and verify the areas of the triangles. I looked at different ways of dividing a rectangle into 3 triangles (where the smallest 2 are right-angled), and then dividing the largest triangle into 3 more right-angled triangles, each having the same area. To get them to fit each triangle has a smallest angle of 30°, so they are all similar (and the green ones are congruent). Which makes the base of the rectangle √(3) times the height. Obviously the three green triangles make up 1/2 (50%) the area (so 1/6 (16.7%) each), and together they are larger than either of the remaining triangles. 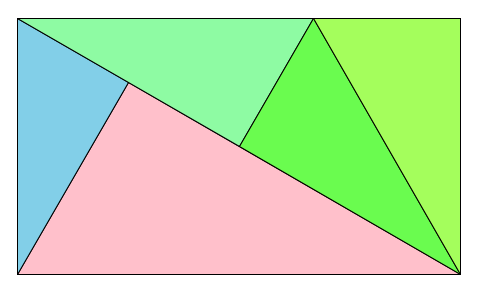 This gives the pink triangle an area of 3/8 (37.5%) and the blue triangle an area of 1/8 (12.5%), so individually the green ones aren’t smaller than the blue one. It turns out this is just a rearrangement of the triangles above into a different rectangle. In this case the base is (4/3)√(3) the height, but it has the same problem as the first attempt. 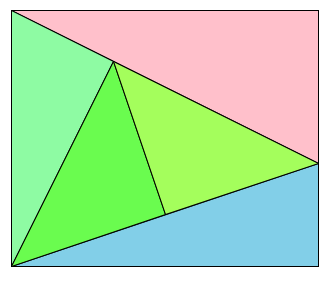 This time the green triangles are not congruent (although they do all have the same area, and it is still 1/6 (16.7%) of the rectangle, so together they still make up half the rectangle), and the big green triangle is not right-angled. But the blue triangle is 1/5 (20%) of the rectangle and the pink triangle is 3/10 (30%) of the rectangle, so this gives us a solution. The base of the triangle is 6/5 the height. Solution: The longer side of the map measures 72 cm.